The area of present-day Zimbabwe has been the site of several organised states and kingdoms since the 11th century, as well as a major migration and trade route. It came under colonial British rule in the late 19th century, declaring unilateral independence in 1965. Over the next 15 years there was internal conflict between guerrilla forces and the predominantly white independent Rhodesian government. A 1979 settlement led to elections and the establishment of a biracial democracy, and following formally agreed independence from Britain in 1980, Robert Mugabe was elected head of state. Zimbabwe continued to experience interlinked economic, social and political difficulties, as well as natural pressures such as drought, and has high levels of poverty and poor health, low life expectancy. A particular issue was land redistribution, which after 2000 radically changed land ownership away from the minority white population who owned 70% of the most productive agricultural land, to black farmers. International sanctions in response to government policies has had significant impact on the country. The effective collapse of the economy was one factor leading to the relatively peaceful ousting in 2017 of Robert Mugabe after 37 years. Minerals (particularly gold but also including platinum and diamonds) are Zimbabwe’s main foreign exports. Although the mining sector is very lucrative, corruption means that much revenue is lost to the state. Land distribution damaged the agricultural sector, once a source of export revenue, and today Zimbabwe is a net importer of food products. However, there have been recent improvements in the number of smallholders practising conservation agriculture and in crop yields. Tourism is also important, but has declined since 2000, today contributing around 8% of GDP. Zimbabwe saw hyperinflaction from 2000, and in 2016 the government allowed trade to take place in US dollars and other hard currencies rather than the Zimbabwe dollar. With relatively low rainfall and unequally distributed surface water resources, groundwater is the main drinking water source in rural areas. Groundwater is also used for irrigation on some commercial as well as smallholder farms. Groundwater is also used to supply some urban water supply systems. However, despite its widespread use, groundwater contributes not more than 10% of total water use. Please cite this page as: Mudimbo, Owen, Crane, Upton, Ó Dochartaigh and Bellwood-Howard, 2018. Most of the country forms part of the central plateau, at an elevation of between 1200 and 1600 m. The east is mountainous, with the highest point at Mount Nyangani at 2592 m.
Zimbabwe. Map developed from USGS GTOPOPO30; GADM global administrative areas; and UN Revision of World Urbanization Prospects. For more information on the map development and datasets see the geography resources section. Zimbabwe has a tropical climate, with a dry season in which little rain falls, and a rainy season that usually lasts from late October to March. Local climate is moderated by altitude. Rainfall is lowest (less than 500 mm/year) in the south and southwest; between 600 and approximately 1000 mm/year across much of the centre of the country; and only exceeds 1000 mm/year in the mountains of the east. 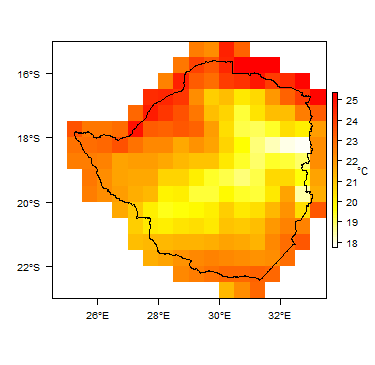 More information on average rainfall and temperature for each of the climate zones in Zimbabwe can be seen at the Zimbabwe climate page. The four largest rivers in Zimbabwe are the Zambezi, Limpopo, Save and Pungwe. These are all transboundary rivers, which flow to the Indian Ocean. Two major smaller rivers are the Thuli and Mzingwane, which are tributaries of larger transboundary rivers. The Zimbabwe National Water Authority Hydrology Department manages information relating to surface water resources availability. Major surface water features of Zimbabwe. Map developed from World Wildlife Fund HydroSHEDS; Digital Chart of the World drainage; and FAO Inland Water Bodies. For more information on map development and datasets see the surface water resource page. Soil Map of Zimbabwe, from the European Commission Joint Research Centre: European Soil Portal. For more information on the map see the soil resource page. Most of the country is covered by savannah vegetation, with the wetter mountainous east supporting tropical evergreen and hardwood forests. 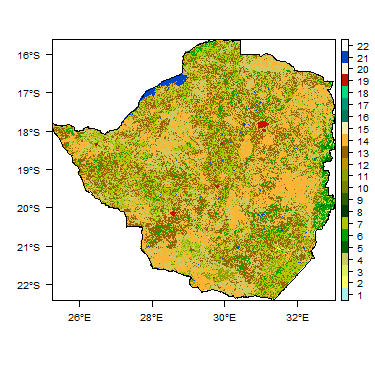 Land Cover Map of Zimbabwe, from the European Space Agency GlobCover 2.3, 2009. For more information on the map see the land cover resource page. This section provides a summary of the geology of Zimbabwe. More detail can be found in the references listed at the bottom of this page. Many of these references can be accessed through the Africa Groundwater Literature Archive. Geology of Zimbabwe at 1:5 million scale. Based on map described by Persits et al. 2002/Furon and Lombard 1964. For more information on the map development and datasets see the geology resource page. Quaternary (Pleistocene to Recent) Unconsolidated sedimentary sequences of alluvial clay, sand and gravel of varying thickness in the river valleys. There are reported alluvium thicknesses of up to 70-80 m in Sabi Valley, and 45 m in the Zambezi Valley. Elsewhere, the unconsolidated deposits are generally less than 25 m thick. Lower Pipe Sandstone and Kalahari Sand. Tertiary and Quaternary The Pipe Sandstone is composed of buff or pink sands. It is unconsolidated in places; in others it is weakly cemented by silica, and traversed by numerous hollow pipes; and in some places it is cemented into a hard secondary quartzite or silcrete. The Kalahari Sand comprises pink or buff coloured, structureless, aeolian sand with a high proportion of fine silt. Approximately 44000 km² of western Zimbabwe is covered by unconsolidated Kalahari Sands. In places, the thickness of the sand is in excess of 100 m.
Upper Karoo Batoka Basalts Triassic The Batoka basalts comprise amygdaloidal lava flows with interbedded tufa horizons. Upper and Lower Karoo Carboniferous to Permian These arenaceous and argillaceous sequences are conventionally subdivided into the Upper and Lower Karoo. The Upper Karoo comprises the Forest Sandstone and the Escarpment Grit. The Lower Karoo consists of the Madumabisa Mudstone and the Upper and Lower Wankie Hwange Sandstone. This thick series of alternating sandstones, siltstones and mudstone is overlain by the Upper Karoo Batoka basalts (see above). Umkondo Group; Deweras, Lomagundi and Piriwiri formations (all part of the Magondi orogenic belt); Sijarira and Tengwe River groups. Mid to Late Precambrian (Proterozoic) These Precambrian metasedimentary rocks include shales, phyllites, quartzites, siltstones, sandstones, conglomerates, limestones and dolomites as well as minor basic metavolcanics. The Deweras, Lomagundi and Piriwiri formations are all part of the Magondi orogenic belt. The Piriwiri Formation comprises phyllites with subordinate quartzites. The Lomagundi Formation comprises slates and shales with minor quartzites. The Tengwe River Group comprises shales. The Sijarira Group comprises shales, siltstones and fine grained sandstones. Precambrian Basement Complex with belts of metavolcanics and greenstones, including the Sebakwean, Belingwean, Bulawayan and Shamvaian supergroups. Early Precambrian / Archaean The Basement Complex covers at least 60% of the country area, including a large portion of central Zimbabwe. It is characterised by vast areas of gneissose rocks into which younger granite bodies of various sizes have been intruded, including Proterozoic granites, and granodiorites, adamellites and tonalites of the Younger Intrusive Granites. The Basement Complex contains irregularly shaped bodies of greenstone material, making up mineralised greenstone/gold belts, which also contain metavolcanics and minor metasediments. Other linear belts are formed by dolerites and sheets of dolerite composition trending in various directions across the Basement Complex area. The Limpopo and Zambezi Mobile Belts are zones of deformed and metamorphosed rocks with a SSW-NNE trend in the south of the country, and a NW-SE trend across the north of Zimbabwe and into Zambia. They comprise paragneisses and anorthosite gneisses. Different weathering thicknesses occurs in the Basement Complex, distinguished by different erosional surfaces. Weathering thicknesses range from greater than 30 to 35 m on the African erosional surface, to shallow, less than 30 m on the Post African and Pliocene/Quaternary surfaces. Moderate to deep weathering occurs within the Greenstone Belts. 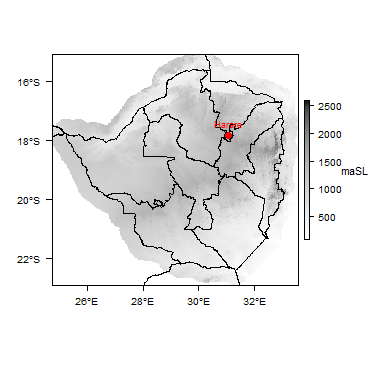 This section provides a summary of the hydrogeology of the main aquifers in Zimbabwe. More information is available in the references listed at the bottom of this page. Many of these references can be accessed through the Africa Groundwater Literature Archive. 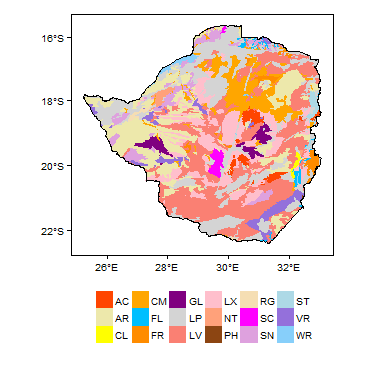 Zimbabwe is also covered by the SADC hydrogeological map and atlas (2010), available through the SADC Groundwater Information Portal. Low: Suitable for primary supplied from boreholes. These groundwater development potential rankings are reflected in the hydrogeology map above, with a description of the aquifer type (hydrogeological environent) of each aquifer. Save Alluvial Aquifer, Umzingwane Alluvial aquifer, Grootvlei/Limpopo (transboundary) Alluvial deposits are only locally developed within Zimbabwe, with the largest occurrences found in the Save (Sabi)- Limpopo river system and major tributaries; along the Zambezi River; and along the Munyati and Sessami rivers in the northwest. 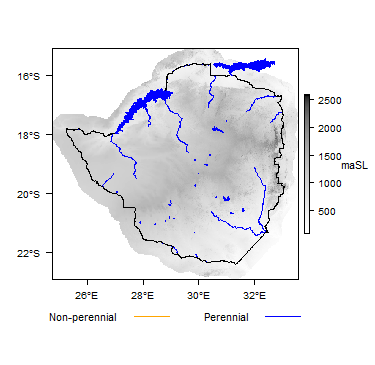 The alluvial deposits vary in thickness, being generally less than 25 m in most areas, but as much as 45 m in the Zambezi Valley and up to 70 m in the Sabi Valley. Where thick and permeable enough, they can form unconfined aquifers with high groundwater development potential. Aquifer properties are extremely variable and may range from locally low to locally high average hydraulic conductivity. The water table ranges from about 5 - 40 m deep, but is generally over 20 m deep. Boreholes in the alluvial deposits are typically 20 – 70 m deep, and provide yields of 100-5000 m³/d. Water quality is generally good. Lenses of brackish water occur in the alluvium of the Sabi river, which may be fossil water and/or water recharging via the adjacent Karoo strata. Kalahari Sands The Kalahari Sands aquifer is mainly unconsolidated, but also include the consolidated Pipe Sandstone. It forms an unconfined aquifer with high groundwater development potential. Boreholes in the Kalahari Sands are commonly 70 – 100 m deep, and provide yields of 100-1000 m³/d. The aquifer properties of the Kalahari Sands are extremely variable and may range from locally low to locally high average hydraulic conditions. The water table is generally over 20 m deep. Igneous – Karoo Basalt Aquifers in the Karoo volcanic rocks are limited to discrete zones of weathering, fracturing and jointing, and contact zones with underlying Forest Sandstone and interbedded sandstone. Wide sheets of basalt occur in the Victoria Falls and Nyamamdhlovu, and Beitbridge and Chiredzi areas with numerous smaller remnants forming high lying cappings in the Gokwe area. Where suitably weathered, they have moderate groundwater development potential. The aquifers are unconfined, and have variable transmissivity from about 9 to 90 m2/d, and specific capacity values of the order of 1 to 10 m3/d/m. The water table is usually less than 15 m depth, and borehole depths average 50 m, varying from about 40 to 60 m. Borehole yields vary from 10 to 250 m3/d. The quality of groundwater in the basalts is good, with total dissolved solids (TDS) concentrations normally below 1000 mg/l. There is no identified fluoride hazard, although it may pose a mild encrustation hazard in places. Cretaceous Sedimentary The aquifer properties of these sedimentary rocks are controlled by primary porosity and permeability. The more favourable horizons are the conglomerates and cleaner sandstones, particularly in the vicinity of rivers. However, overall these aquifers have low groundwater development potential. Water tables are typically less than 15 m deep, and boreholes are usually drilled to 70 – 100 m depth. Transmissivity is usually less than 1.5 m2/d, and specific capacity below 10 m3/d/m. Water quality is moderate to good with total dissolved solids (TDS) concentrations ranging from less than 1000 mg/l to 2000 mg/l. The water poses a potential encrustation hazard. Nyamandhlovu Forest Sandstone aquifers (Karoo) The Forest Sandstone is widely developed in the Hwange – Zambezi Basin and constitutes an important regional aquifer, with high groundwater development potential. It is mainly confined, being unconfined only close to outcrop. Boreholes are typically 30 – 100 m deep, with water levels sometimes less than 10 m depth but more commonly greater than 20 m depth. Yields range from 0.1 to 5.9 l/s. Recharge estimates indicate an annual recharge of 105.5 mm with 38.4%, 52.1% and 9.5% accounting respectively for direct recharge, water mains and sewer leakages (Rusinga and Taigbenu 2005). Water quality is generally good with total dissolved solids (TDS) concentration below 1000 mg/l. There is no recognised fluoride threat, although it may pose a mild encrustation hazard. Escarpment Grit The Escarpment Grit forms a confined aquifer in the Hwange and Save-Limpopo basin, with a high groundwater development potential. Boreholes are typically 30 – 100 m deep, with water levels about 10 – 15 m and greater than 20 m depth respectively. Yields range from 1.2 to 3.5 l/s. Madumabisa Mudstone The Madumabisa Mudstone is associated with shallow weathering, but has low groundwater development potential. Boreholes are typically 30 – 100 m deep, with water levels about 10 – 15 m and greater than 20 m depth respectively. Yields are relatively low in the Madumabisa Mudstone (0.1 - 0.6 l/s); successful boreholes are usually sited in the vicinity of rivers. Upper and Lower Hwange (Wankie) Sandstone The Upper and Lower Hwange Sandstone is widespread in the Karoo basin and has high groundwater development potential. It is found at depth and the aquifer is always confined. It was previously known as the Wankie Sandstone. Boreholes are usually 100 – 150 m deep in the Upper and Lower Hwange Sandstones. Yields range from 1.2 to 5.8 l/s. Precambrian Metasediments - Lomagundi Dolomite and Tengwe River Formation Some water-bearing horizons exist within the Precambrian metasediments. Aquifers exist primarily due to karst features in the calcareous rocks of the Tengwe River and Lomagundi Dolomite formations (massive dolomites and limestones). Karst features are thought to be developed to an average depth of approximately 60 -70 m. Weathering of shaley horizons in the limestones also increases the potential for groundwater storage and flow. The Lomagundi Dolomite has high groundwater development potential. Average specific capacity of boreholes is 505 m3/d/m. Typical borehole depths are 60 to 80 m . The water level varies from ground level at spring occurrences to 50 m depth, depending on land use (commercial or subsistence farming). The Tengwe River Formation has moderate groundwater development potential. Borehole specific capacity is 4 to 120 m3/d/m. Typical borehole depths are 50 – 70 m. Water levels tend to be generally shallow (about 10 m) in the area of Tengwe limestone/shaley limestone. Yields of 500 - >2000 m3/d are possible. Water quality in the Lomagundi Dolomite is generally very good with a slightly hard calcium/magnesium character. Water quality in the Tengwe River Formation is generally very good with a slightly hard calcium/magnesium character. - the granite and gneiss below the Post-African and Pliocene Quaternary erosion surfaces. These aquifers have low groundwater development potential. The highest groundwater development potential is found in those areas possessing the deepest and most aerially extensive weathering as in the larger African surface. Chemical weathering along faults, shear zones and dyke contacts may produce equally important water bearing structures. Incorrectly sited boreholes may fail during the dry season. Granite and gneiss below the African erosion surface Rocks beneath the African erosion surface have relatively well developed hydraulic properties resulting from extensive weathering, which generally exceeds 30 - 35 m in depth. Aquifer thickness is about 30 to 50 metres; boreholes are usually drilled to 40 – 50 m depth. Sustainable borehole yields are in the region of 50 - 100 m3/d. Here, transmissivity is low to moderate (<10 m2/d) and specific capacity is moderate (30-50 m3/d/m). Groundwater in the aquifers beneath the African erosion surface is generally of good quality with a total dissolved solids (TDS) concentration below 1000 mg/l and no recorded fluoride hazard. Granite and gneiss below the Post-African and Pliocene Quaternary erosion surfaces The hydraulic properties of the rocks beneath the Post-African and Pliocene-Quaternary erosion surfaces are considerably less well developed. Areas of weathering tend to be patchy and shallow (10 - 30 m). Aquifer thickness is about 10 to 30 m, often less than 15 m. Boreholes are typically 30 – 40 m depth. The transmissivity of these rocks is low (1 – 10 m2/d), while boreholes have low to moderately low specific capacity of the order 2 – 20 m3/d/m. Areas of granite and gneiss pavement, very shallow bedrock and inselbergs and other features producing positive relief common in the Post-African and Pliocene/Quaternary surfaces are associated with marginal to nil groundwater resources. In aquifers associated with the Post-African and Pliocene/Quaternary surface the groundwater quality is generally good. TDS is usually below 1000 mg/l, however it is higher in the Beitbridge and Nuanesti area (TDS of 1000 to 2000 mg/l) where there is also a fluoride hazard. Greenstone belts, including the Bulawayan Supergroup The rocks of the Greenstone belts generally have very low permeability, but groundwater occurs where fracturing and weathering have created adequate porosity and permeability, and consequently this aquifer has high groundwater development potential. The Bulawayan Supergroup can support yields of 1.2 - 2.9 l/s (Interconsult 1986). The average borehole depth is in the range 30 - 50 m, and the water level is typically from 5 to greater than 20 m below ground level. Overall, all the hydrogeological units in Zimbabwe are suitable for the development of small, single point primary water supplies, either by means of dug wells or by boreholes. Units classified as possessing moderate or high groundwater development potential are capable of supporting more extensive exploitation for piped water supplies and irrigation schemes (Interconsult 1985). The groundwater quality throughout Zimbabwe is usually good and generally does not pose any constraint to use for human consumption. Of the constituents that are a threat to health, the few cases of high nitrate are ascribed to poor borehole construction. High fluoride is found in isolated pockets in the Gokwe area and appear to be associated with the outcrop area of the Wankie (Hwange) Sandstone. At the regional scale, fluoride concentrations are not a constraint to exploitation (Interconsult 1985). Groundwater is the main drinking water source in rural parts of Zimbabwe. According to the 2012 census, about 38% of a total of 3,059,016 Zimbabwean households fetched their water from boreholes and protected wells (Zimbabwe National Statistics Agency 2012). The total annual abstraction of groundwater in the rural areas, from an estimated 40,000 boreholes, is estimated at 35 x 10 6 m³. In addition to domestic use in rural and urban areas, groundwater supplies agriculture and industry in Zimbabwe. The total groundwater abstraction for the agricultural sector is estimated at 350 x 10 6 m³. Groundwater is also abstracted for emerging towns known as Growth Points (e.g. Gokwe), urban centres (e.g. Bulawayo) and rural institutions (e.g. schools, health and business centres). Overall, groundwater presently contributes not more than 10% to the total water use in Zimbabwe (Sunguro et al. 2000). In rural areas, water is mainly abstracted by boreholes fitted with a hand pump, due to limited electrification. The standard hand pump in Zimbabwe has traditionally been the unique ‘Zimbabwe bush pump’, which is relatively robust, but a lack of maintenance and support of all water supply infrastructure has led to increasing levels of failure. Electric borehole pumps are more common in urban areas, although there has been an increase in the number of private urban boreholes where there is inadequate municipal water supply infrastructure. The Ministry of Environment, Water and Climate Resources is responsible for the formulation and implementation of sustainable policies regarding the development, utilisation and management of water resources in cooperation with user communities and institutions. The Water Act (1998) established the Zimbabwe National Water Authority (ZINWA), a parastatal tasked with providing a framework for the development, management, utilisation and conservation of the country’s water resources through a coordinated approach. ZINWA has a groundwater branch tasked with specifically looking into the management of the national groundwater resources. The Water Act also specifies the establishment of Catchment Councils. Seven catchment councils were established in the major hydrological zones of the country, with functions covering both groundwater and surface water, including: preparing an outline plan for river systems, determining applications and granting water permits, regulating and supervising the use of water, supervising the performance of functions by Sub-catchment Councils, and dealing with conflicts over water. However, due to the limited capacity and lack of adequate information regarding the quantity of groundwater, groundwater resource management poses a challenge to the councils. Recent developments in the major cities have seen a collapse in municipal water treatment and distribution systems, with a shift towards the private use of groundwater at household and even industrial levels. There has been a rise in bulk water suppliers abstracting huge volumes of groundwater. This has led to new challenges in dealing with conflict over falling groundwater levels in residential areas, which the catchment councils have inadequate capacity to deal with. In addition to the Water Act (1998), groundwater regulations and guidelines were developed for Zimbabwe in 1999 to control groundwater development and management. The regulations and guidelines compliment the Water Act (1998) and have been formulated within a framework of integrated water resources management (IWRM). Medium Zambezi Aquifer (Zambia, Zimbabwe). The following summary is taken verbatim from the IGRAC report, Groundwater Monitoring in the SADC Region, which was prepared for the Stockholm World Water Week in 2013 (IGRAC 2013). “Groundwater resources management is carried out by the Groundwater Department of the Zimbabwe National Water Authority (ZINWA). ZINWA is a parastatal under the Ministry of Water Resources Development and Management. Monitoring of groundwater level fluctuation is currently confined to only three major aquifers. These are the Lomagundi Dolomite Aquifer situated in the north western part of the country, the Nyamadlovu Sandstone Aquifer situated in the south western part of the country and the Save Alluvial Aquifer located in the south eastern part of the country. Water levels are measured using data loggers and readings are collected monthly. Chloride deposition has been monitored in six monitoring stations throughout the country but has been discontinued due to lack of funds. The information was used in the assessment of groundwater recharge rates. The Department also used to carry out chemical surveillance on groundwater and surface water but again the programme was suspended due to lack of resources. Groundwater fluctuation levels are recorded on template sheets during the last week of the month by field observers who send the records to the main office in Harare. The data is recorded in Excel and an initial quality control exercise is performed. The data is then reformatted and importated into a national groundwater database called Hydro GeoAnalyst. The software has proven to be quite versatile and meeting the needs of ZINWA. Hydrographs and groundwater maps are produced which assist in overall groundwater development and management. The main challenges encountered relate to lack of financial resources, logistical support and limited staff. Another challenge is related to vandalism of facilities by local communities. In certain instances, monitoring boreholes are clogged with debris making water level recording impossible. Specialised entrances for data loggers and locking mechanisms are currently being manufactured for monitoring boreholes in the Save Alluvial Aquifer. It is desired to revive both the chloride deposition and chemical surveillance programmes and to have telemetric (real time) data collection for the water level fluctuations.” (IGRAC 2013). Many of the references below, and others relating to the hydrogeology of Zimbabwe, can be accessed through the Africa Groundwater Literature Archive. Interconsult. 1985. National Master Plan for Rural Water Supply and Sanitation. Volume 22 Hydrogeology. Ministry of Energy and Water Resources Development, Zimbabwe. Zimbabwe Surveyor General. 1994. Zimbabwe Geological and Mineral Resources Map, scale 1:1,000,000. Surveyor General, Zimbabwe. Chikodzi D. 2013. Groundwater resources of Zimbabwe: An assessment of fluctuations. International Journal of Scientific Reports, 2, 629. Davies J and Burgess W G. 2014. Can groundwater sustain the future development of rural Zimbabwe? Derman B and Manzungu E. 2016. The complex politics of water and power in Zimbabwe: IWRM in the Catchment Councils of Manyame, Mazowe and Sanyati (1993-2001). Water Alternatives 9(3): 513-53. Dube T. 2013. Emerging issues on the sustainability of the community based rural water resources management approach in Zimbabwe: A case study of Gwanda District. Erpf K. 1998. The Bush Pump-the National Standard Handpump of Zimbabwe. A review by SKAT/HTN to find out what had made this pump so popular in Zimbabwe. Skat, RWSN (incl. HTN), St Gallen, Switzerland. IGRAC. 2013. Groundwater Monitoring in the SADC Region. Morgan P and Chimbunde E. 1991. Upgrading family wells in Zimbabwe. Waterlines, 9(3), 10-12. Morgan P, Chimbunde E, Mtakwa N and Waterkeyn A. 1996. Now in my backyard—Zimbabwe's upgraded family well programme. Waterlines, 14(4), 8-11. Morgan P and Kanyemba A. 2012. A preliminary study of training artisans in upgradeable techniques for family owned wells. Aquamor. Rusinga F and Taigbenu AE. 2005. 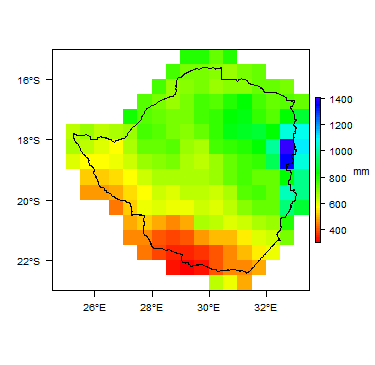 Groundwater resource evaluation of urban Bulawayo aquifer. Water SA Vol. 31 No. 1 January 2005. ISSN 0378-4738. Sunguro S, Beekman HE and Erbel K. 2000. Groundwater regulations and guidelines: crucial components of integrated catchment management in Zimbabwe. “1st WARFSA/WaterNet Symposium: Sustainable Use of Water Resources; Maputo 1-2 November 2000”. UN-IGRAC. 2012. Transboundary aquifers of the world, update 2012. 1:50 000 000. Sepcial Edition for the 6th World Water Forum, Marseille. Water and Sanitation Program. 2011. Water Supply and Sanitation in Zimbabwe Turning Finance into Services for 2015 and Beyond. An AMCOW Country Status Overview. Zimbabwe National Statistics Agency. 2012. Zimbabwe Population Census, 2012. This page was last modified on 19 March 2019, at 15:44.